This article is in support of the Election Polling Places application available from the ArcGIS Resource Center. You may have been sent here from our entry in the ArcGIS Resource Center: Election Polling Places - Use FME to update the polling places data set with your data. The purpose of this article is to describe the FME Workspace attached to this article (FME Workbench Poling Places examples). Either FME Desktop or the Data Interop for ArcGIS (ETL tool) can be used. The related FME Workspace Template is attached and contains sample data. The Data Interop for ArcGIS toolbox will be used in ArcGIS while the workspace is for FME Desktop. It is assumed that you have downloaded the Election Polling Places application and have access to the LocalGovernment.gdb that is the targeted database of the attached workspace or you can use the ArcGIS for Local Government geodatabase template (located here: http://www.arcgis.com/home/item.html?id=5f799e6d23d94e25b5aaaf2a58e63fb1) to write out to a new geodatabase file. 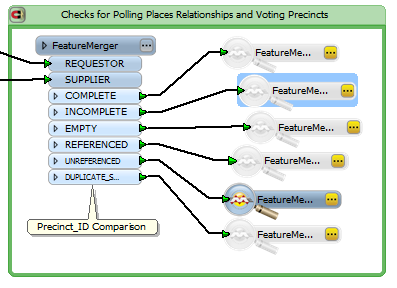 Open the workspace in FME 2012 SP2+ or open the Elections Toolbox in ArcGIS and then open the Polling Places Spatial ETL by right-clicking and choosing 'Edit'. The following is a screen shot of the Workspace that you will be using to populate the Local Government Geodatabase with Polling Places. 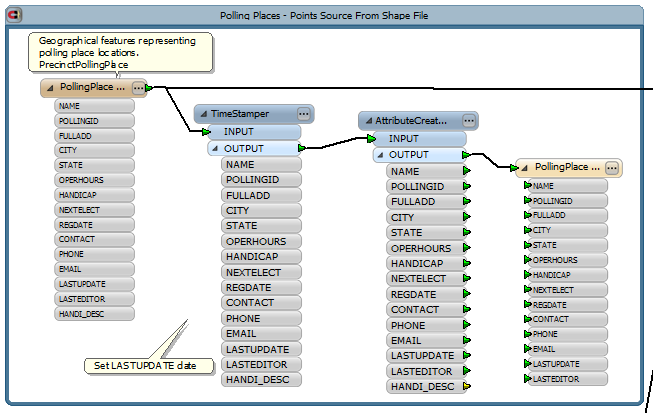 In the above area we read the existing polling places feature (Shape format) and write it out to the LocalGovernment file geodatabase as feature type PollingPlace. We update the LastUpdateDate and LastEditor attributes when writing. In the above bookmark we read in an Excel file (xls) that contains relationship information that ties Voting Precincts to Polling Places. This is also written out to the LocalGovernment file geodatabase as feature type PrecinctPollingPlace. We update the LastUpdateDate and LastEditor attributes when writing. The attached FME Workspace template has a sample Excel file that you'll want to populate with your own relationship data. You can also make use of your own source data which may require tweaking this area of the workspace. In the above bookmark we read in the Voting Precincts source data (Shape format) and the write out the feature type as VotingPrecincts to the LocalGovernment file geodatabase. We update the LastUpdateDate and LastEditor attributes when writing. NOTE: This feature type is used by our second Election Results supporting workspace. In this area we check that all Polling Place features have a reference in the Excel file. This will identify any issues where a polling place doesn't have any voting precinct related. The unreferenced port of the FeatureMerger is directed to a Visualizer and this will open Universal Viewer if any features that pass out this port.. In this area of the workspace we are checking that all Voting Precincts are related to a polling place in the Excel spreadsheet containing those relationships. If any fail they are set out the unreferenced port and the Universal Viewer will open with the Voting Precincts not related. In FME use the Prompt and run and enter the username running the update. The workspace is intended to assist you in loading the data into the existing LocalGovernment file geodatabase that comes with the Polling Places application. It should not be necssary to change any of the parameters on the Writers or the outgoing feature types. It is expected that you may have different source formats and schemas and you may need to tweak this workspace to work with your own data. If you have issues or questions related to this workspace please contact us at fme.ly/support and title the subject as "ArcGIS Local Government Polling Places" so it is quickly directed to the best resource here at Safe Software Support. Don't hesitate to leave comments at the ArcGIS Resource Center by following this link. 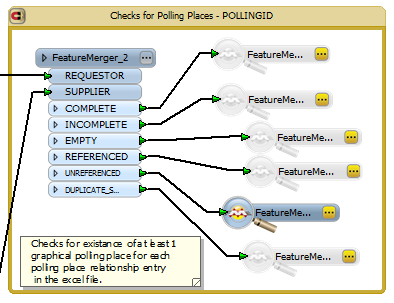 FME's Polling Places Workspace.